The spat between the Northern Irish player and World Snooker boss Barry Hearn rumbles on. MARK ALLEN STAGED a silent protest as the war of words between him and Barry Hearn continued last night. The 25-year-old saw off Ali Carter to reach quarter-finals of the UK Championship in York – then turned up for the press conference with his mouth taped up. The novel protest lasted about 15 seconds before he broke the silence to reiterate his feelings towards the World Snooker chief. On Tuesday, Allen claimed Hearn was only out to make money for himself and called for his resignation after being angered by the changes to the tournament’s format. The verbal attack earned the world number 14 a referral to the WBPSA and yesterday Hearn responded by calling Allen a “silly little boy”. While Allen has admitted he was wrong to use foul language, he believes the stance he has taken is the right one. ”I don’t think I said too much out of line,” he said. ”Obviously I swore, which is bang out of order and I apologise again for that, but I still stand by the rest of the things I said. ”I think there’s a lot of truth in the comments that I made. Allen plays Marco Fu in the last eight this evening after the Hong Kong cueman overcame world number one Mark Selby 6-3. 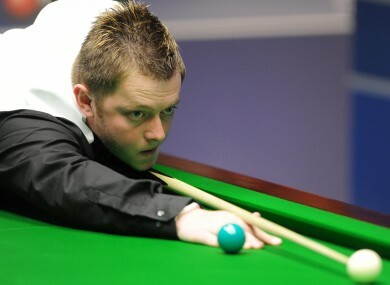 Email “Gagged: Mark Allen stages silent protest at UK Championship”. Feedback on “Gagged: Mark Allen stages silent protest at UK Championship”.